Bradley University wanted to give students a hub for recreational and social activities while attracting new students. In 2005, Bradley University commissioned Counsilman-Hunsaker, in association with PSA-Dewberry, to study and ultimately design a new athletic and recreation facility that would provide exercise and practice space for intramural sports and general recreation facilities. 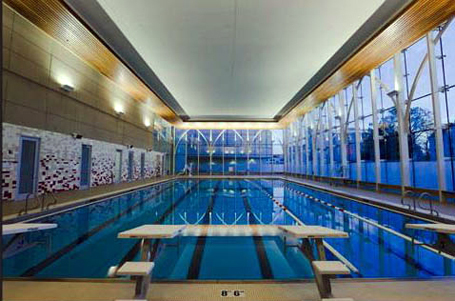 Responsible for the design of the new swimming pool, Counsilman-Hunsaker created a functional, attractive facility that includes a six lane 25-yard salt water pool. This pool has the latest in pool sanitizing technology which minimizes the necessity for deliveries and handling of chemicals. Benefits also include safer handling and storage, easier maintenance, and lower operating cost. Other elements of the new 130,000 sq. ft. Markin Family Student Recreation Center include jogging/walking track, weight training, aerobics and fitness facilities, climbing wall, lobby, lounge, juice bar and café. The $25 million facility completed in the fall of 2008.